On July 21 at Oura, Nago City, Yasuhiro Makishi explains how to work his hand-made Habu catcher. 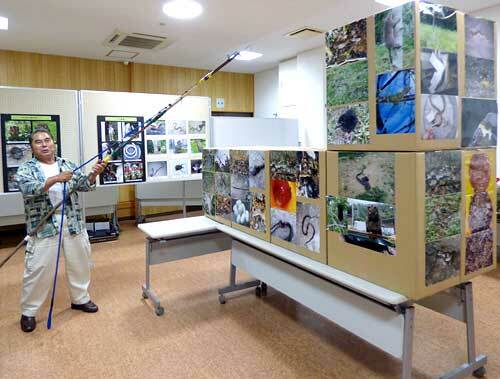 Master-hand at Habu hunting from Mihara Nago City, Yasuhiro Makishi has opened an exhibit at the Wansaka Oura Park displaying pictures of habu and other wildlife. The exhibition is called “Habu and Friends in the Forest: Photo Exhibit of Habu and Rare Creatures in Yambaru”. You can see approximately 130 photos of powerful Habu and rare wildlife in Yambaru. The exhibit is open until August 22. For 30 years, Makishi has been catching Habu in forests in three villages in Kunigami County. In total, Makishi has caught approximately 20,000 Habu and 60,000 smaller Himehabu. While exploring the forest, he has been taking pictures of the unique creatures he has found. Makishi catches 400 to 500 habu a year. He has been bitten a few times. On Saturdays when Makishi will be present at the exhibit, he will demonstrate the first-aid treatment he uses. At the venue, there will be a tasting of Habu-sake made by Makishi and sales of Habu oil, which is good for cuts. The entrance fee is 300 yen. High school and younger students are free. The exhibit is open from 10 a.m. to 6 p.m. For inquiries, call 0980(51) 9446.